The American Wind Energy Association (‘AWEA’) claims big wind had a spectacular 2015, but we looked past the slick advertising and found the same AWEA rhetoric with extra pixie dust applied. According to the American Wind Energy Association (“AWEA”) big wind had a spectacular 2015. Jobs were up 20%, emissions down, more wind megawatts were installed than any other fuel source, and happy landowners pocketed a cool $222 million for their trouble. The media dutifully sang America’s good fortune. Imagine: a last Congressional vote in December mandating $15.8 billion in wind PTC payouts and everything is now right as rain. That is, until you look past the slick advertising and realize the boasted gains are nothing more than AWEA rhetoric with extra pixie dust applied. The industry touted 15,000 jobs added in 2015, bringing the total to 88,000, including 1,800 new manufacturing positions. Impressed? Don’t be. For one, AWEA continues to be the primary source of wind-related employment statistics, so it’s impossible to validate the claims. Second, the figure represents modeled, not actual jobs, and, typical for AWEA, it bundles all types of jobs into the one number–including direct, indirect, and induced. The “induced” wind job belongs to the guy who landed part-time work serving coffee at the local diner to transient wind workers at a nearby construction site. Induced jobs are more abstract and inherently unreliable but a convenient way to inflate the numbers. If Navigant’s 2011 wind study is any indication, induced jobs likely represent up to 26% of AWEA’s 2015 job number. The table below shows how AWEA’s total and manufacturing job numbers have expanded and contracted since 2007. In terms of employment in the electric-power generation sector, wind represents just 2% of all jobs; fossil and nuclear dominate at 91%. On a per megawatt basis, wind offers just 0.05 full-time positions. Finally, if AWEA publicly released its breakdown of direct and indirect jobs, we’re likely to find the 15,000 new positions did not translate into net job creation for 2015. AWEA reveled in the fact that wind was the largest source of new electric generating capacity in 2015, representing 41% percent of all new electric power placed in service for the year. The last time wind could make that claim was 2012 (see chart). But when considering the larger power market, the boast is not meaningful. Demand for electricity in the US has declined in 5 out of the last 8 years and, overall, has dropped 4.4% since 2008. If economic market signals mean anything, no one should be building new generation except to replace retiring capacity units. Since wind is an energy, not a capacity resource, it’s not the right fit for replacing retirements, no matter what AWEA hopes the public will believe. But for big wind, the economics don’t matter. Thanks to federal subsidies, RPS mandates, and long-term power purchase agreements, developers are paid to construct turbines regardless of power market signals. In this scenario, the only economic concern is whether there’s a buyer for a project’s power long-term. As long as the 30% federal investment tax credit is an option, finding the best wind resource with adequate transmission capacity isn’t even that important. A Penny for Your Land? AWEA positions wind energy as an economic development engine for poor, rural areas across America. Landowners are paraded before policymakers to tell their stories about how the family farm was protected from subdivision, and their way of life preserved, after deciding to diversify into wind. AWEA crowed how, in 2015, wind projects paid $222 million in lease payments to landowners for hosting the turbines. The tale is impressive, but a closer look suggests wind developers are opportunistic predators exploiting the unwitting. It’s laughable to believe wind projects deliver any economic wealth. It’s American taxpayers who are enriching the landowners. Perhaps that’s what we should have done all along and skipped the turbines, especially considering how wind projects have repeatedly divided and harmed small, rural communities. Moreover, the notion that an agricultural way of life has been preserved by big wind doesn’t cut the mustard. As reported before, the lease payments frequently funnel to absentee landowners who inherited the land from their retired farmer parents and now sun in Florida where the turbines don’t spin. AWEA never misses an opportunity to praise states like Iowa, South Dakota and Texas for the wind energy each consumes. In 2015, Iowa took top billing for achieving 31.3% penetration followed by South Dakota at 25.5% and, according to AWEA’s charts, Vermont reached 15.4%. Again: impressive numbers, but not accurate. Each megawatt hour of electricity produced by a wind turbine, also produces a second commodity referred to as a renewable energy credit (“REC”). RECs represent the “environmental benefit” and can be sold separately from the energy. The right to lay claim to a megawatt hour of wind energy solely belongs to the party who acquires the REC. Since RECs can be traded across state lines, the physical location of the wind turbine is not relevant. The renewability claim travels with the REC. Thus, if the output of a wind project sited in Iowa is contracted by an Illinois or Minnesota utility, Iowans cannot lay claim to the wind. For Iowa, the wind production is no cleaner than coal. The same holds for Texas projects should the renewable energy credits get sold into the private Green-E REC market. Vermont residents have long taken issue with this point and earlier this year the Vermont Law School Energy Clinic filed a formal complaint with the State’s Attorney General insisting that in-state utilities who sell their RECs to out-of-state parties are misrepresenting the ‘green-ness’ of their resource portfolios. Despite four operating wind projects in the state totaling 119 megawatts, Vermont can’t lay claim to any of the wind! Every REC is sold to offset the high price of wind. But even if all of Vermont’s in-state wind RECs were retired by Vermont utilities, the best the state might achieve is 4.4%. AWEA’s 15.4% is wildly inaccurate. There’s much more we can write about the misrepresentations and omissions plaguing AWEA’s rosy perspective on wind, like the fact that wind is a very minor, but very costly means of reducing emissions. The industry players know they’re not being straight with the public or policymakers, but they don’t care. Why upset anyone with the facts when billions of public dollars are on the line? And so it goes. Other jobs covered project development, construction and turbine installation, operations, maintenance, transportation and logistics, and financial, legal, and consulting services. In December 2015, AWEA was still claiming 73,000 jobs overall for 2015. There are also folks receiving nominal annual payments under so-called ‘good-neighbor agreements.’ In return for the money, neighbors of the operating wind plant grant the project permission to produce noise, shadow-flicker and other nuisances on the neighboring properties. Great article Lisa! I’ve also wondered if the RECs are being double counted and used double in some cases. I came across some evidence that perhaps when California Mission Edison owned Minnesota wind projects, that they were getting credit for that in the California PSC (C-RETS) and the utility that buys the electricity in Minnesota was claiming the RECs to meet the Minnesota RPS mandate for wind (M-RETS). For a while the same organization out of California was running both RETS systems too. -We do not count induced jobs in our total. If we did, our total jobs would be much higher than 88,000. The 88,000 jobs we report are direct wind industry jobs building and operating wind projects and their components. -Wind is primarily being built to displace fossil fuel use and emissions and protect against volatility and uncertainty in the price of fossil energy. Ask the dozens of utilities buying wind and they will tell you that wind is saving their consumers money. 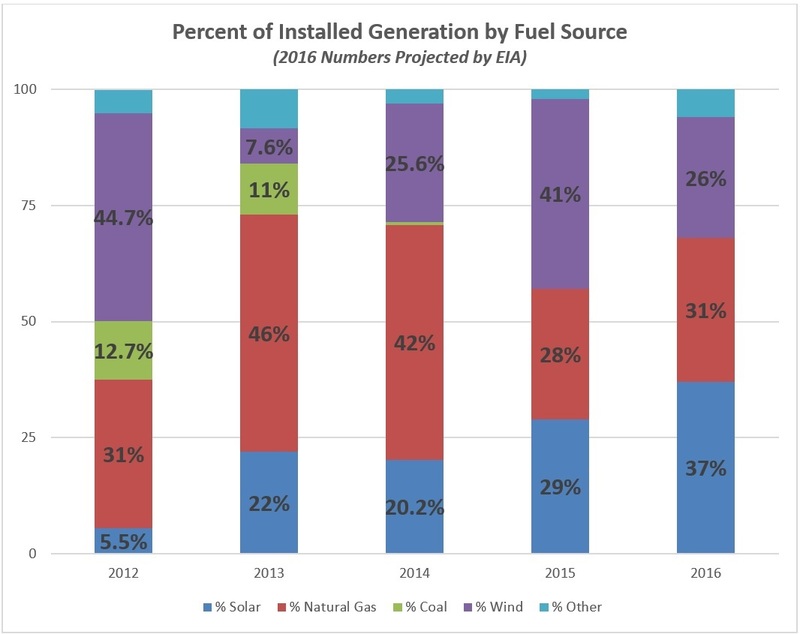 -Our report makes very clear that generation is reported as a share of in-state generation, just as EIA reports. Michael, thanks for your comments. I would ask that you release the modeling results on which AWEA is basing the 88k jobs to prove induced jobs are not being counted. Is the 2011 job figure (75,000) also direct jobs? And every year after that? EIA, as you know, does not track where the the RECs go after they’re generated. It is well known that MidAmerican, for example, has multi-year contracts to sell RECs out of state. So perhaps AWEA can answer what percent of wind energy Iowan’s consume? Wind had the “best year” in 2015 indeed but the trend showed a reversal in the growth. The 22 GW production is a pittance on the 465 GW U.S. electricity consumption. And how much does the unreliable wind energy cost? The Cape Cod Wind project died when it was proven that its electricity would cost ~25 c/kWh where whole price today is 2 cents and residential is 10 cents. Thanks for another excellent poke at the gaping lies of AWEA and job myths. Those European job numbers are lessons, that North American has not seemed to pay much attention to. 2.2 net jobs lost in Spain, 4 in the UK, and 5.4 in Italy….and the approximate cost to run those green jobs, around in some cases, $800,000. Each.